The Midland Regional Lean Network will be an integral part of the Lean Business Ireland Strategy. Its aim is to bring together excellence in the region and to provide a forum to network, collaborate, and learn. 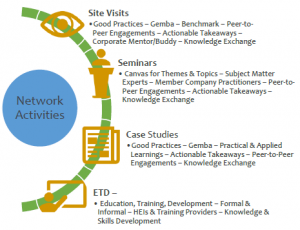 The network and its events will be for organizations at all stages of their lean journey and of all sizes. Events will be focused and conducted in a timely manner, with site visits and seminars on topics as defined by the network. The leadership team will be industry led and organizations are invited to form the 1st leadership team. 04th March: Growing LEAN: An Introduction to LEAN Thinking – Doing Things Better, Smarter, Cheaper & Together! This is a hands on facilitated workshop from the award-winning LEAN team in Jigsaw Consulting. You will gain an understanding of what LEAN Thinking is, how this approach can be applied to your business, Lean Wastes, and most importantly, Eyes for Waste. You will be introduced to some core LEAN tools like 6S, Standard Work, and Flow, take part in practical LEAN exercises and have the opportunity to discuss your business challenges with Jigsaw LEAN Black Belts. You will also hear how the Local Enterprise Office Kildare, Enterprise Ireland and the IDA are supporting businesses to Grow LEAN. This site visit as part of the Midland Lean Network event programme is to Dawn Farms in Naas, Co. Kildare. The theme for this visit is LEAN CULTURE. The purpose of the Midlands Lean Network is to provide a regional forum and community for Lean practice in the midlands. 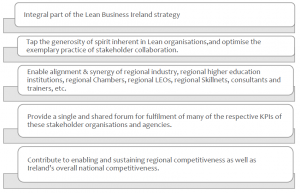 It forms part of the Lean Business Ireland plan to advance the national ecosystem that combines education, research, practice, and knowledge -exchange and to deliver value to the long-term competitiveness and sustainability of Irish organizations. It will follow the Triple Helix thesis for a knowledge Society and will be made up of Academia, Industry, and State organisations. It will be a place for those achieving excellence to share it and for those seeking it to Go See. Membership of the network and attendance at events is open to all organizations of all sizes, no matter where you are on you Lean journey. We encourage organizations to become members, stay in touch and attend events. Being part of the network will grow your Lean network, allow you to build relationships with peers, seek and share knowledge and arrange 1-2-1 visits. The leadership team of the Midlands Lean Network will be industry led, supported by representatives from Academia, State organisations (Enterprise Ireland, IDA, Local Enterprise Office), and Service Providers. Commitment to the leadership team will be a monthly meeting for 1 hour, in person or remotely. In the run up to annual events, more time may be required. It is expected that the leadership will plan events for a 12-month cycle including site visits, seminars, and case studies, with the support of the wider team. It is planned to rotate leadership positions annually. It is planned to do the following in line with the wishes and needs of the network. A network event is planned to take place on the last Thursday of each month from October to May and will be focused and conducted in a timely manner (2-3 hours). It is planned to launch the network on September 27th, at a venue to be confirmed. 1. Become a member by completing a simple online form.